They say: “we have discovered that as Christ draws us closer to the full visible unity which is his will, we are led to the foot of the Cross, where we stand together with the One who bears the pain of broken humanity. This too is a deep experience of communion which some have described as a communion of poverty, of persecution, even of blood. “During these days together, we have shared testimonies from both communities, struggling in dire circumstances in our respective regions. These included environmental degradation; mass migration; war and persecution resulting in refugees, displaced populations, and post-conflict trauma; societal decisions eroding the dignity of human life from beginning until natural end; human trafficking and modern slavery. This ‘ecumenism of the Cross’ unites us as we bear together the plight of our people who face the challenges of our troubled world. “An essential dimension of our ‘communion of the Cross’ is standing with the poor, and reaching out together to reveal Christ’s presence among those at the margins of our world. South Sudan, Pakistan and other places of conflict were very much in our prayers. During their meeting, 19 pairs of Anglican and Roman Catholic bishops were “sent out” for joint mission by Pope Francis and the Archbishop of Canterbury from the very place from where Pope Gregory sent Saint Augustine to be the first Archbishop of Canterbury. 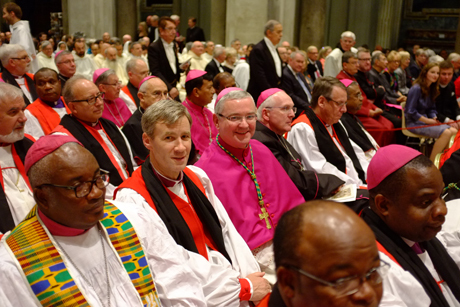 “Mindful that Jesus sent his disciples forth in pairs, we as pairs of bishops … go forth now motivated by our commission to continue our pilgrimage to unity and mission, developing plans of action, spreading the vision we have shared among our episcopal counterparts, our clergy, and our lay faithful.